Ever since Supper opened, I wanted to check it out. We finally made it there for my birthday this year and had a great time and even better food. Let me begin by saying that their chef, Mitch Prensky, is a pretty cool dude. I met him a few years back at the Super Fresh on South Street. He was buying something strange like marshmallows and hot sauce and I struck up a conversation about how I hoped he wasn’t going to put those two food items together. He was super friendly which further piqued my interest in Supper. We didn’t make it there until this year, but it was definitely worth the wait. Four enthusiastic thumbs up to Supper for both the food and service. Fast forward to last night. My best friend lives just a few blocks from Supper and we’ve been trying to find time to check out their Sunday Supper–a prix-fixe, buffet-style supper that takes place the first Sunday of each month. Well, yesterday was BFF’s birthday and she proposed Sunday Supper. Never one to turn down a dinner at Supper (or supper at Summer?) I enthusiastically agreed. The day before dinner, my friend texted me to let me know that her in-laws would be joining us and asking if we minded. I forgot to mention that she has the unfortunate delight of sharing her birthday with her mother-in-law. Don’t get me wrong–her mother-in-law is a lovely woman, however this fateful date will never be hers alone. We got to the restaurant and they led us upstairs where the buffet was taking place. While we waited for the in-laws, the four of us ordered some cocktails. I was a little confused when she asked my husband and I whether we wanted olives in our dirty martinis. Dirty martinis=olive juice + olives, right? When my husband’s drink came crystal clear and without olives, she hurriedly brought him some, although I don’t believe she actually “dirtied” our martinis. Although it was a buffet, they included one menu per table so we were able to see what we would be eating. My friend’s parents (I’m friends with the husband too, so it seems silly to keep calling them the in-laws) are not the most adventurous eaters and we all knew that this would be a stretch for them. The menu looked delicious to the rest of us though. I started by loading up my plate with a bit of everything. 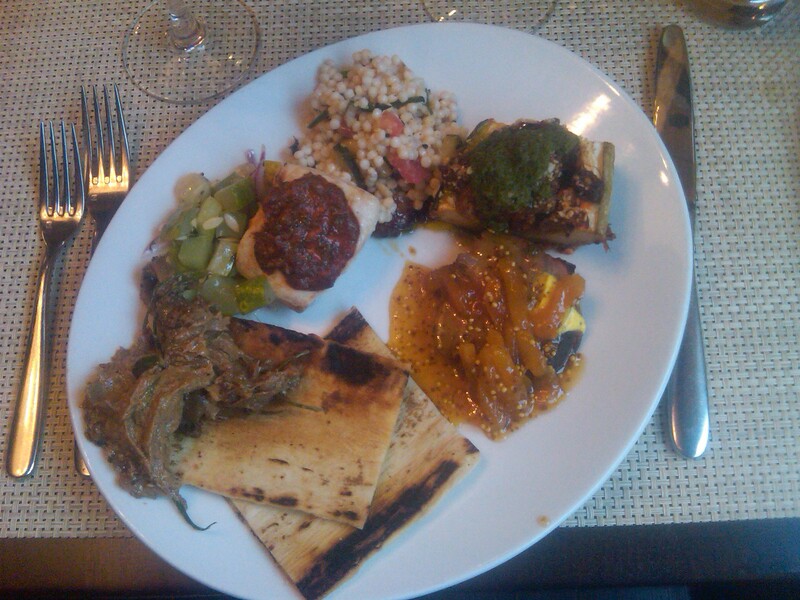 From the top, going clockwise, the dishes are toasted Israeli cous cous with Blue Elephant Farm herbs and vegetables; roasted summer squash stuffed with Blue Elephant vegetable tagine, feta and toasted almonds; grilled lamb shoulder marinated in yogurt and mint and topped with apricot chutney; grilled flatbreads with eggplant salad–there were two different types. One was smoother and one was chunkier and Charmoula roasted striped bass with Blue Elephant cucumber and onion salad. Highlights for everyone included the bass (his mom loved it!) Folks were mixed on the lamb, although I think it was personal preference more than anything else. 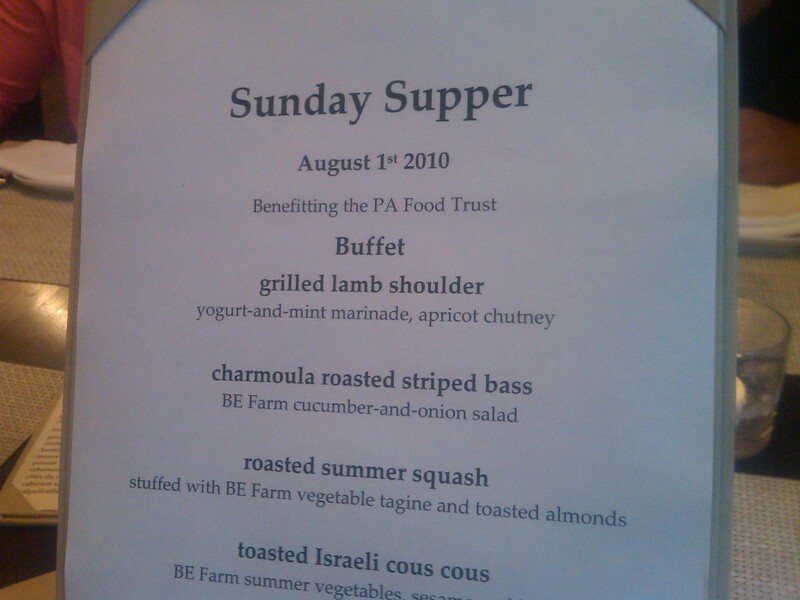 I’m not a huge lamb eater, but I enjoyed with the (as you can see) plethora of apricot chutney. The cous cous and stuffed squash were nice, summery sides. I loved the texture of the cous cous but felt like it was a bit too acidic at times. The squash was flavorful but a bit tough to eat due to the size. As silly as it sounds, I enjoyed the nicely charred flatbread with eggplant and even topped it with chutney on my second trip up to the buffet. 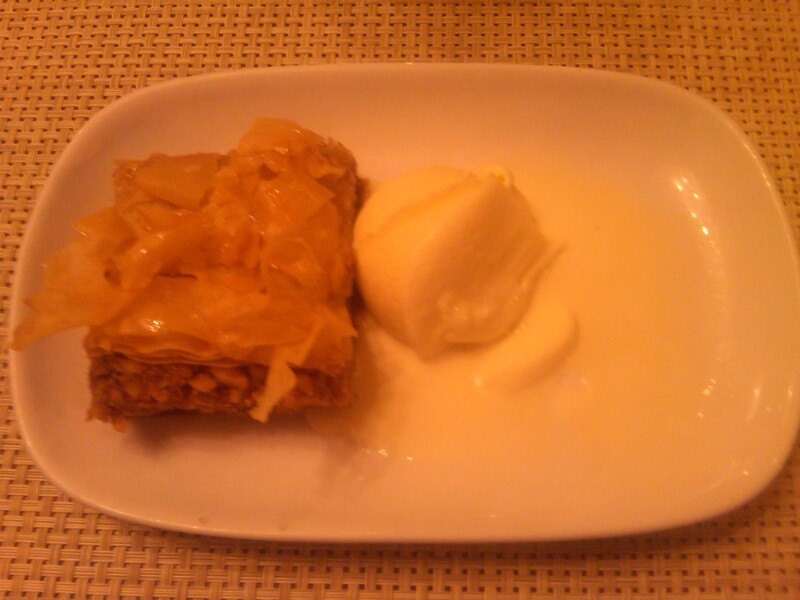 We finished with walnut baklava with cardamom ice cream. Sorry for the poor picture quality. I promise I’ll stop using my camera phone at some point. It was hard to get a read on others’ takes of this dessert because we were all so full by the time it was brought to the table. I quite enjoyed the syrupy sweetness of the walnut baklava and scooped up a little spoonful of ice cream with each bite. The cardamom flavor was definitely present, yet not overwhelming. Overall, we had a truly enjoyable evening. The two birthday girls seemed to enjoy themselves and we shared lots of laughs, including me mishearing a “Black Mandarin” drink order as a “Black Man Drink” (my friend’s father is African American and I did a double take when I heard him order) and our stifled laughs regarding a book that his mom sent my friend and described as “kind of like Stephen King with a Christian twist.” When we left the restaurant, our night was completed by the shock that his parents had #1 Parked in a handicapped spot with no handicapped tags and #2 Had not been ticketed! I guess that is the ultimate birthday gift. Overall, Sunday Supper was a relaxing, pleasant and definitely tasty way to spend our Sunday evening. If you are interested in going, I would suggest that you check the menu to make sure you’re interested in what is being served and BYOB. Although I enjoyed my martini, we could have saved some money by BYOBing a few bottles of wine as they waive the corkage fee during Sunday Suppers. Check it out!